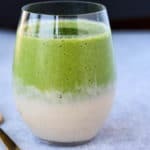 This Matcha Energy Green Smoothie recipe is a great way to energize your morning, plus supercharge your health with tons of micronutrients. Literally the first thing I did when I got home from Iceland two weeks ago was to make a green smoothie. I had been craving one almost the whole time I was gone! The loooong trip home combined with the time change had me dragging. Traveling from East to West is supposedly easier than the other direction, but I kept waking up at 3:45 am on the dot for almost the first week after we were back. Ugh! Out of that tiredness came this Matcha Energy Green Smoothie, because I used matcha powder as the energizing component. Have you ever used it? I’ve been seeing matcha lattes alllll over the web recently, probably because it is often better tolerated by women than coffee as a pick-me-up, although I use both, ha ha. 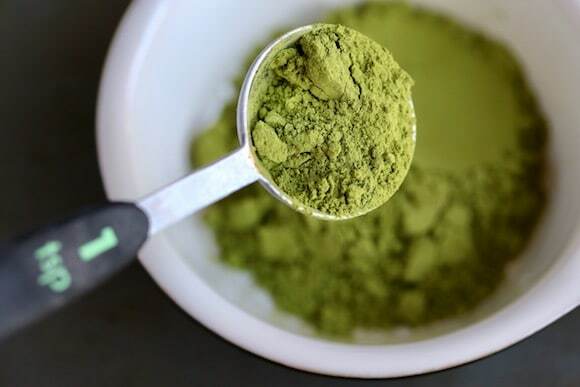 Matcha is made from a special type of green tea leaf and it’s sold most commonly as a ground fine powder. I have seen it used in a quantity as low as 1/4 of teaspoon, but I used a full teaspoon in this recipe. 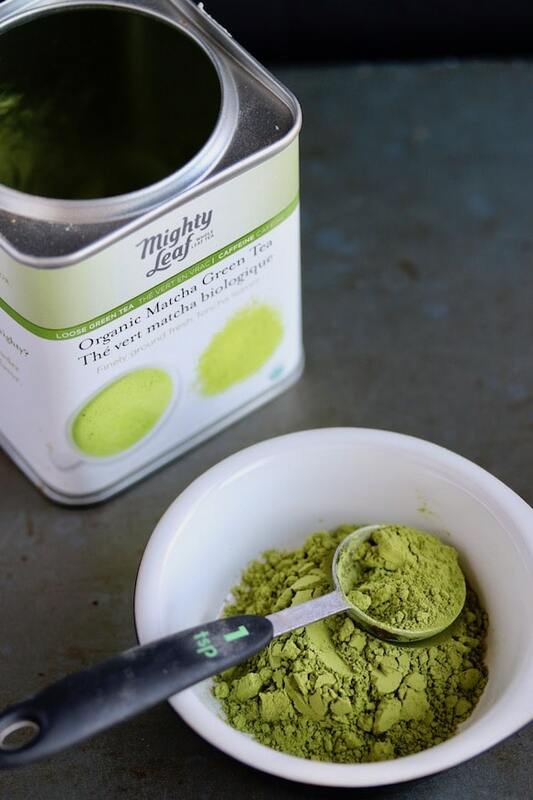 I use the Mighty Leaf organic matcha powder. This isn’t a sponsored post, but it’s a brand I found online and I thought it was a reasonable price, especially for organic. Buy it here (affiliate link included)! 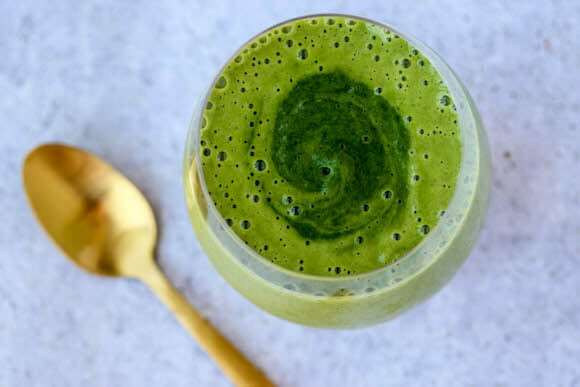 This recipe I’m sharing today for my Matcha Energy Green Smoothie makes one nice big serving with a total of 480 calories and 33 grams of protein from the Equip collagen peptides I used. Those beautiful shades of green were exactly what I was looking for to help get over my energy slump and jet-lag. The extra nutrition from the cauliflower helped get me feeling back to my normal self. BTW, I wrote about how to steam and freeze the cauliflower florets in this blog post. Even now, two weeks later, I’m still enjoying this smoothie as one of my new favorite breakfasts (see all my dairy-free smoothie recipes here). It’s so healthy but so delicious too! This easy and delicious smoothie recipe makes one big serving, or two small servings. Enjoy in the morning for an energizing start to your day! Combine the water, hemp seeds, banana, cauliflower florets, kale, matcha powder, and collagen powder in the base of a high-speed blender. Process on high until the ingredients are thoroughly combined, about 45 seconds. *I like to steam my cauliflower florets for about 5 minutes in a steamer basket before freezing. This helps reduce any bloating I experience from consuming the cauliflower. Feel free to use raw frozen cauliflower florets if you prefer. 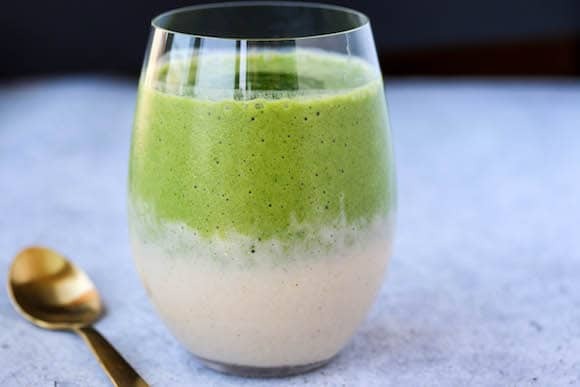 *For the two-tone effect of this smoothie, I left out the matcha and kale and poured a little at the bottom of the glass before finishing off the recipe. I just ordered matcha for the first time and it should arrive in the mail today – can’t wait to try out this healthy smoothie! Thanks, Sarah!!! I can’t wait to see what you make with your matcha! Looks so yum! Love that you added hemp seeds and cauliflower! Thanks, Joni! The cauliflower is one of my new smoothie favs! Love matcha, and what a great idea to turn it into a smoothie! I bet it’s extra creamy. What a beautiful smoothie! Super nutritious too! This sounds delicious, so pretty with the layers too. I love that you steam the cauliflower, I do so much better digestion-wise with steamed veggies in smoothies. Same here, Emily! I’ve even gotten back to steaming all my greens too. XO. I need to try cauliflower in a smoothie! Can you also use raw cauliflower or do you think it is best to have it steamed? I love those colorful layers! How beautiful! I can’t believe I haven’t tried matcha yet! You’ve made me feel like I really need to get on the ball and make it happen! Thanks, Christina! Matcha is great, I hope you love it!!! XO. Yum, love seeing so many great brassica veggies in a smoothie. They are my fave though I always need to steam them too to keep my tummy happy! This looks great! Thanks, Monique! I’d love to see some of your green smoothie recipes! I use matcha regularly and I love it. I absolutely love how beautiful the layers look too. I am just loving the idea of steaming the veggies. I always add them raw. I think the steaming would be perfect for a delicate stomach too. I also have not added cauliflower to any smoothies. Great idea! I have all the ingredients. This will be my morning breakfast! Thanks for the note, Eileen! LMK how this smoothie turns out for you! XOXO.